Do you want your videos to stand out from a long stream of other videos? And do you want to capture the attention of your viewers and keep them captivated no matter how long your video is? These online video tips help you accomplish all that. If you're posting your video on YouTube, then a sizzling title would be a search engine optimized title. At the very basic level, that means you put your target keyword in the title of, your video, the description, tags, and so on. 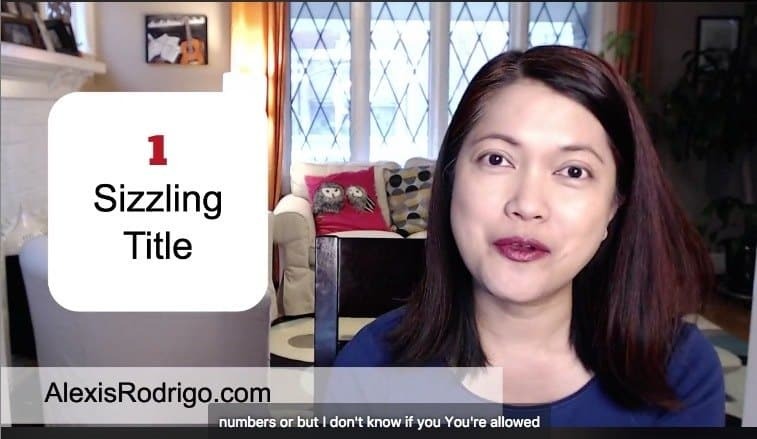 But if you're putting your video on Facebook, then a sizzling title doesn't have to contain your target keyword but it has to have a hook something that will grab your viewers attention. For example, if you saw this video on Facebook, then probably seeing "Sesame Street" in the title grabbed your attention, especially if you grew up watching Sesame Street. That's one of the ways you can write a good title is to mention a celebrity in your title. For example if I were to say put up a video with the title, "Presentation Skills I Learned from Steve Jobs," that would probably pique your interest. And you would probably click on that video to watch it. That's one way you can write a sizzling video title. Another way is the "how to" title. Every one of us is obsessed about learning new things and new skills. So, putting "how to" in the title of your video is one way to grab people's attention. But don't be boring about it. Put something more exciting words into it. Don't just say, for example, "how to create a screen capture video." That's kind of boring. How about "How to easily create a marketing video in one minute"? Something like that makes it sizzle more, right? And my third tip for writing a sizzling title is to use numbers. People love it when you're specific and numbers make your title specific. For example. the alternate title of this video is "3 ways to power up your videos." The number three makes it very specific. It also gives your viewers a guide as to what to expect from the video. So, when I'm talking about the third way, then you know that I'm about to finish. There are other ways you can use numbers in your title. The previous example, "How to create a marketing video in 5 minutes," has a number in there as well. 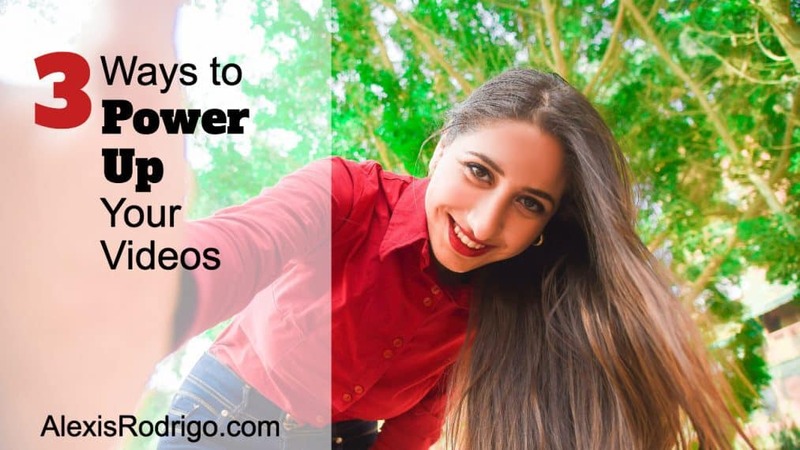 BONUS: Grab your copy of the 3 Tips to Power Up Your Videos! Caption your video even if you you're not targeting the hearing impaired or anything like that. Here's why you want to put captions on your videos: On Facebook, 80% of videos are watched with the audio off. If you'll notice, when your video appears in the news feed, the audio is switched off by default. The viewer needs to switch it on if they want to watch your video. The thing is, most of the time, they don't switch it on. I think that's because there's still checking out your video if it's something worth watching and switching the audio on. That is why you want to put captions on your videos. If people are not going to switch on your audio and your video is just a talking head, then how are people going to understand what you're saying? And how are you going to attract them into watching the rest of your video? Facebook used to make this really easy for us. When you're editing your video Facebook lets you generate captions for your video right into Facebook. But just the other day, I discovered that this feature no longer exists. I was double checking yesterday, preparing for this presentation, and I confirmed that you can no longer generate captions for your videos right Facebook. I'm really sad about this because that was a cool feature. Good news: Facebook's video caption generator is back! You can also use something like Trint. That is an AI-powered transcription service or you can use any other transcription service that you want. However, Trint is inexpensive. I believe it's $15 for every hour. The other option you have is Rev.com. With Rev, your video will be transcribed by humans, not AI, so it's more accurate. You'll still have to double-check either way. Rev is $1.00 per minute, so it's up to you and your budget. Of course, you don't have to caption every single video. At the very least, if you're going put up a video ad then make sure to caption it. Now we are getting to the exciting part, which is the success secret from Sesame Street. Let me give you some background and tell you a little story. If you haven't heard yet, I worked in children's television for a while many years ago. The producers of that program learned from the producers of Sesame Street, which is the children's television workshop. Normally, we don't think of learning as fun. So, how does Sesame Street make learning fun so that children actually enjoy watching them and they remember them? Sesame Street modeled its segments from TV ads! TV ads are very attractive and in those days, when Sesame Street started, we didn't have Netflix. We didn't have cable and we didn't even have remote controls. You had to stand up and turn a knob to change channels. It wasn't easy to skip TV ads. What we can learn from TV ads is that they're short, they're punchy, they're interesting, and they're very memorable. TV ads, because they're expensive, they last 30 seconds to one minute at the most. So, I'm not telling you to only create 1-minute videos. Unless you're making a TV spot then that would be short. This is easier if you're doing a pre-recorded video. When you're editing your video, you'd have cuts. Even if it's a talking head video, you cut to different camera angle, or maybe you zoom into your face, and then zoom out. You do what we call "cutaways." That means, right now you're seeing my face, then I can cut away and show you something else. But what about for live videos like this a Facebook Live? There are different ways to fabricate "cuts" for live streamed videos, too. For example, you've noticed that I have a text box. Every time I change the text box, that's like a different cut. There's a change what your viewers are seeing. If you're doing a live video, you can't cut to different scenes (Note: Unless you're using Ecamm Live, which I use. It lets you switch between different cameras). Another type of "cut" could be sharing my screen. If I switch to show you my screen, that's another way to do a cut. Another way is to use props. For example, if I suddenly said "Look at look at this," I can hold up a prop. That's one way you're changing the pace. Suddenly there's something different in the visuals and that's like you're cutting scenes in your video. Other ways include camera movement, or you yourself could move. If I suddenly stood up and started dancing here, that is one way I can keep a fast pace in my video. Of course, you only do these things when they're relevant. In the early early Facebook Live, some people used to hold up handwritten signs, because they couldn't put text overlays. They would make a sign on a sheet of paper and hold it up like that. And I thought it was hilarious because it was so low-tech and also because Facebook shows a mirror image of your visual. So, sometimes their words would be reverse. Now we can do fancy things like putting our text overlays, switching to a different camera, sharing our screens. Maybe a year from now we'll be doing Facebook Live videos with transitions. You never know, right? The first reason, which you might have heard, is that the average attention span of an adult human being is now shorter than that of a goldfish. The average attention span is only six minutes. That can be your guide. Every six minutes, something should be changing with your video. But I think even six minutes is too slow. For example, if your video is 15 minutes long, I would say maybe every couple of minutes, there should be something happening on your video. And if your video is even shorter, say just one minute long, then these changes or cuts should be even faster. Watch those TV ads and see if you can reverse engineer how they keep everything so interesting visually. See if you can learn from that. The second reason you want a fast pace is because of our lizard brains. Our lizard brain is the part of our brain that is focused on survival. One way it does that is by being hypersensitive to changes in our environment. That's because in prehistoric times, that's how you would survive if you were out in the wild. You have to quickly spot those changes in the environment because it could be a predator that wants to eat you. Somehow, through the years, we have kept that part of our brains. That's why we're attracted by bright shiny new objects. We tie that subconsciously to our idea of survival. That's why you want to use these tips to give your videos a fast pace. Just to review, you can achieve that with your pre-recorded videos through cuts and transitions. With your live videos, you can still achieve that with text overlays, props, and camera movement or your own movement. 1. Give your video a sizzling title. 3. Give your videos a fast pace. I hope you enjoyed these tips and I hope you will use them in your future videos. 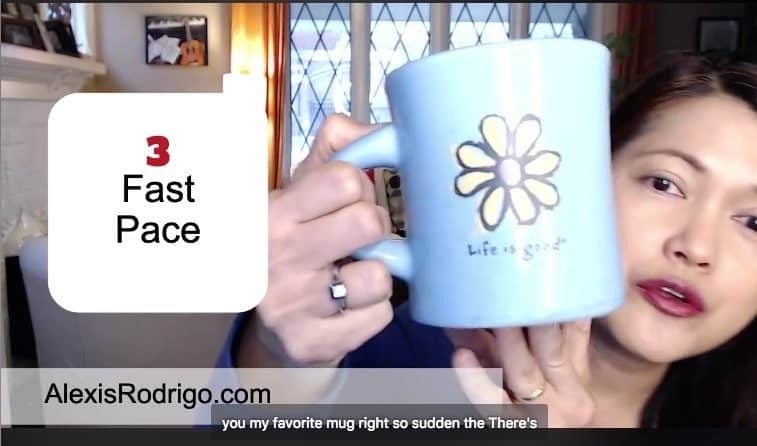 Meantime, if you would like to go deeper with how to shine with video in 2018, then I invite you to watch my webinar. Sign up to watch it here.